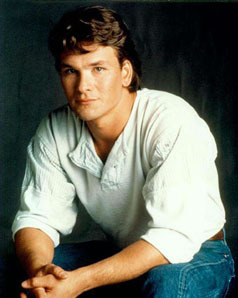 Patrick Swayze first attracted attention for his portrayal of a gang leader in the 1983 adaptation of S. E. Hinton's The Outsiders. The following year came major roles in Grandview, U.S.A and Red Dawn and in 1985, the TV miniseries North and South. But he scored a breakthrough as Johnny Castle in 1987's coming-of-age film Dirty Dancing, which became an unexpected success and for which he received a Golden Globe nomination. In 1989 came another success, Road House, where he played Dalton, a bouncer brought in from New York City tasked with cleaning up the Double Deuce bar in Jasper, Montana. Swayze's third major entry into the American cultural milieu followed in 1990's romantic drama Ghost as Sam Wheat, a man killed during an apparent aborted robbery. As a ghost, he realizes the robbery was actually planned and he must find a way to warn his girlfriend Molly, played by Demi Moore, that her life is endangered. After Ghost Swayze was never short of work, but none of it achieved the success of that film. A 2009 television series, The Beast, lasted 13 episodes. In March 2008 he announced his diagnosis with pancreatic cancer, later acknowledging that alcohol and tobacco use may have contributed to his poor health. He succumbed to the cancer on 14 September 2009 at his home in Los Angeles. Hollywood Walk of Fame 18-Aug-1997 at 7018 Hollywood Blvd.